A lot of people think those who want to sic the immigration police on what they perceive as criminals (as opposed to decent freedom loving people which is what they are) consider themselves moral. This story from the NYT on how the immigration authorities went after a 10 year old girl who needed gall bladder surgery exposes that lie. One of the newest arrivals this week at the Baptist Children’s Home Ministries facility for child migrants in San Antonio, Tex., is 10 years old. She has cerebral palsy. Her name is Rosa Maria Hernandez, and she does not understand why, days after undergoing emergency gallbladder surgery, she has not yet seen her mother, even though they are less than a three-hour drive apart. “Do I get to go home tomorrow?” she asked her mother on Wednesday evening, when they spoke over FaceTime. “I told her that she was only there because she was recovering, and once she was recovered, then she could come with me,” recalled her mother, Felipa de la Cruz, speaking in Spanish. The truth is that Ms. de la Cruz does not know when her daughter will be released. They live in the border town of Laredo illegally, and when Ms. de la Cruz sent Rosa Maria to Corpus Christi for the surgery early Tuesday, the girl’s ambulance was stopped at a Border Patrol checkpoint. After agents learned the girl was an undocumented immigrant, they followed her to the hospital and guarded her room. When she was discharged, the agents took her to the shelter, which houses juveniles in immigration custody. 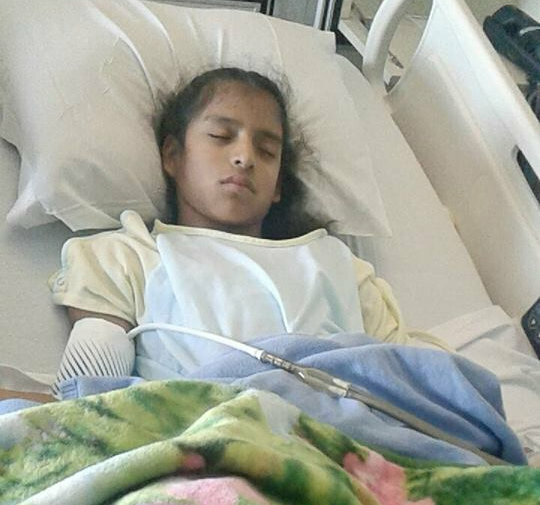 Rosa Maria Hernandez, 10, who has cerebral palsy and was brought to the United States illegally as a baby, was detained this week after undergoing surgery in Texas. Wow, wonder what the brave men and women of the Border Patrol tell their children when they go home at night. We bet its about how they went after a 10 year old patient and got her shipped to a juvenile facility. Wonder if they leave out the part about the CP or that she just had gall bladder surgery. Such courageous men and women who serve the Trump immigration agenda. Meanwhile, all of the attendants at the Value Voters meetings and all the right wing ministers said . . . . nothing.